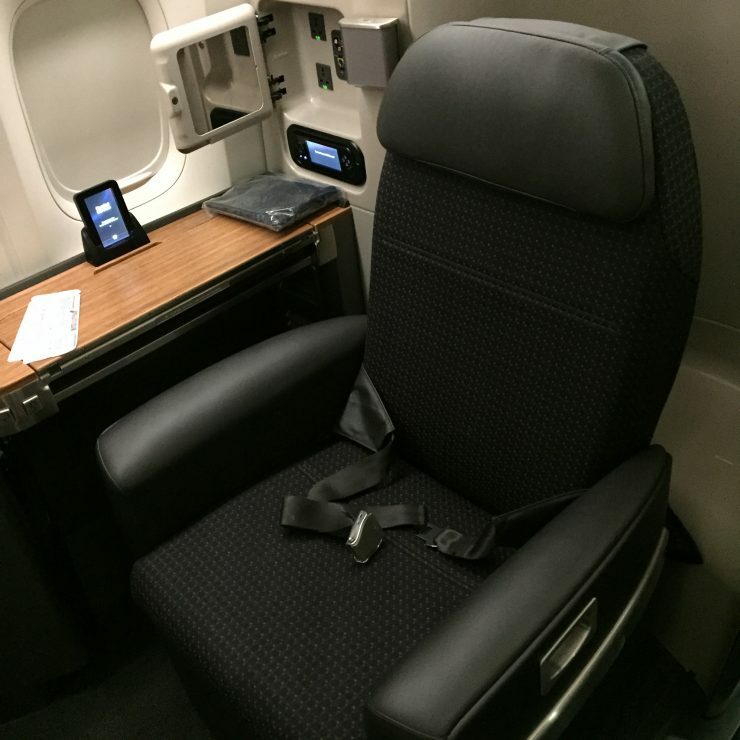 As Gary Leff has been known to say: Business class is usually the seat. 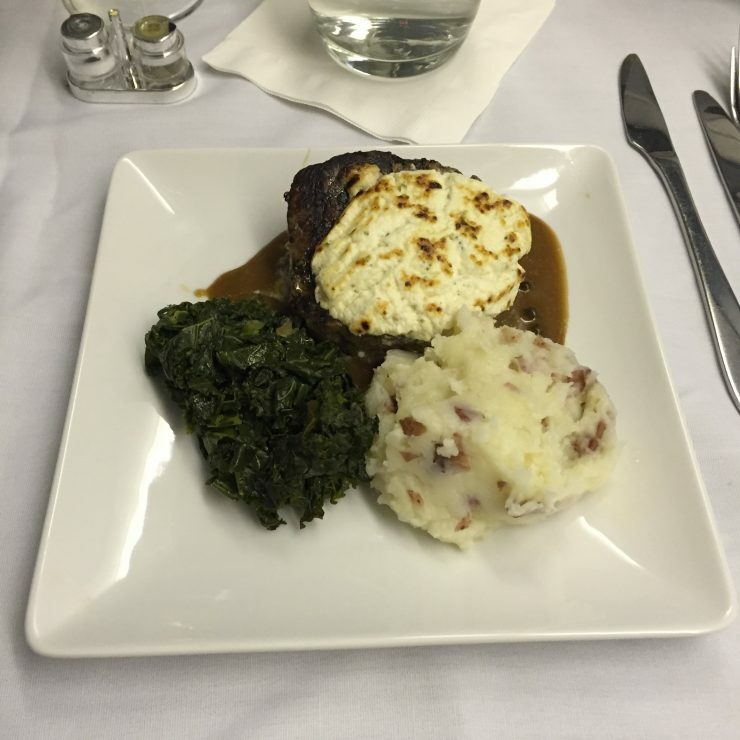 First class is all about the experience. 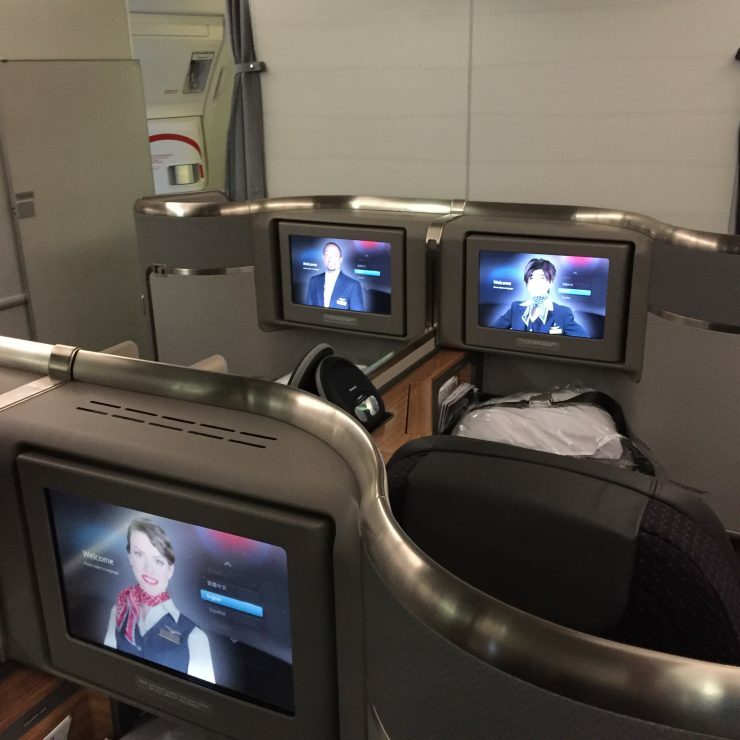 Our 1st First Class experience was flying from Sao Paulo, Brazil to Dallas. It was probably the middle in experience, on an American Airlines 777-300ER (my favorite aircraft type). 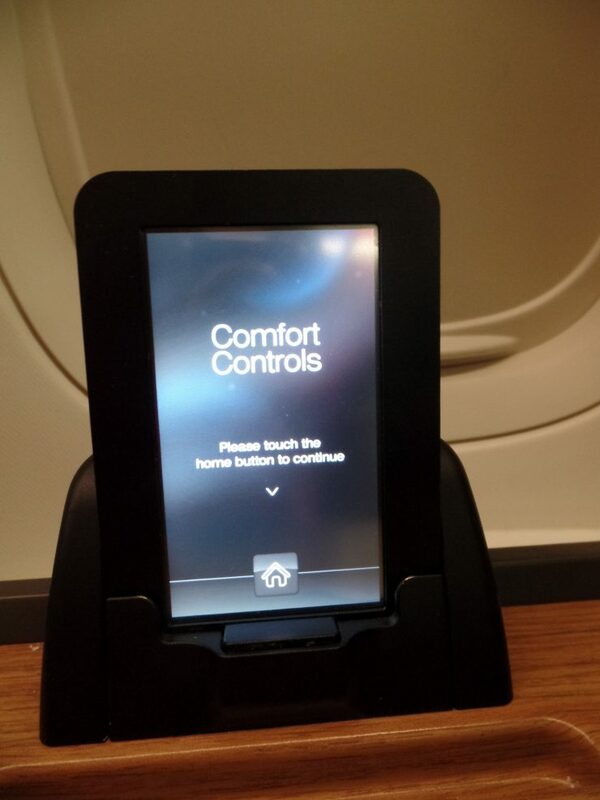 It’s not an amazingly innovative product, but it is the best that American Airlines has to offer. There are small refinements over the previous generation that make a huge difference, such as a larger screen, a slightly more comfortable seat pitch for take-off and landing, normal power ports, and for coffee drinkers, an Espresso machine. 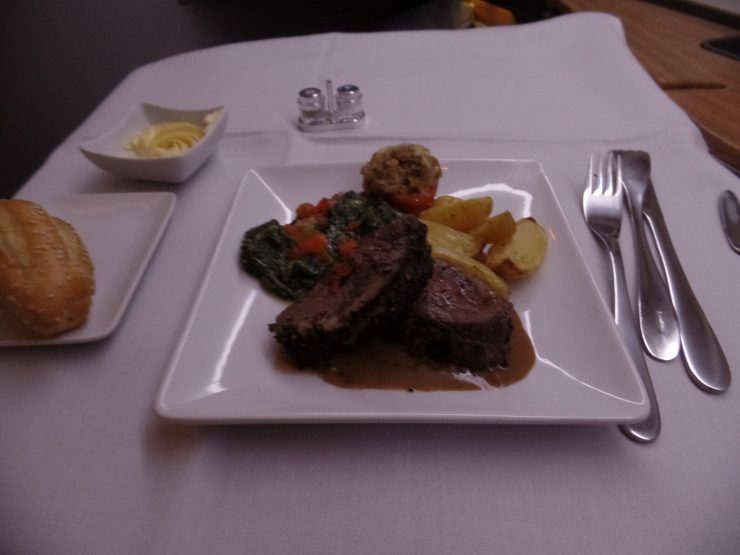 The flight Sao Paulo, Brazil to Dallas featured a Chateaubriand for dinner, which I thought was good, but too heavily seasoned with cracked pepper. The pea soup appetizer was perhaps the best part of the meal, believe it or not. I certainly enjoyed many of the wine and champagne options offered. Perhaps the most notable thing I experienced on this flight, was that the flight attendant taking care of our row, was very proud to be serving a true first class champagne. 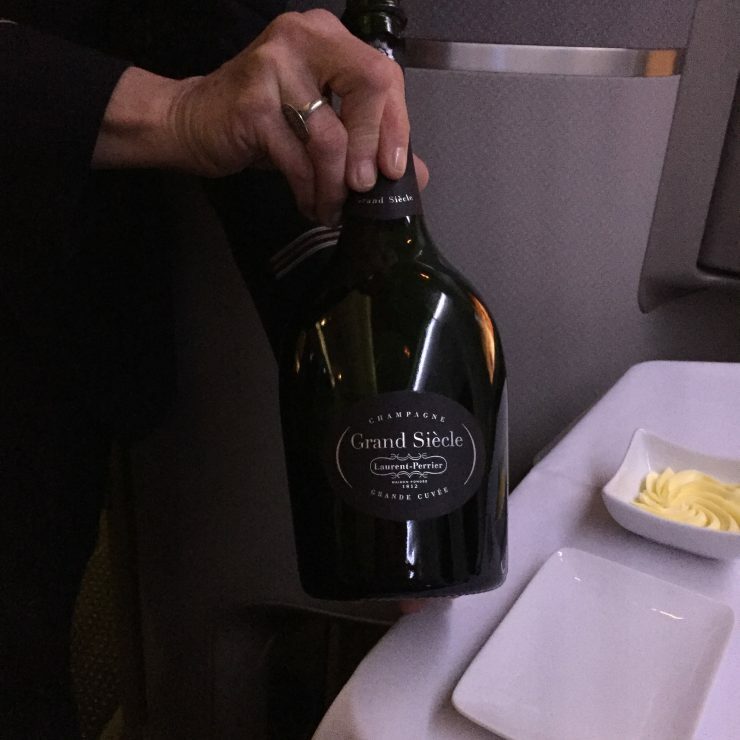 Laurent-Perrier Grand Siecle is not my favorite–and no, Dom nor Krug are either–but the fact is, these small things truly make a difference in the First Class experience. 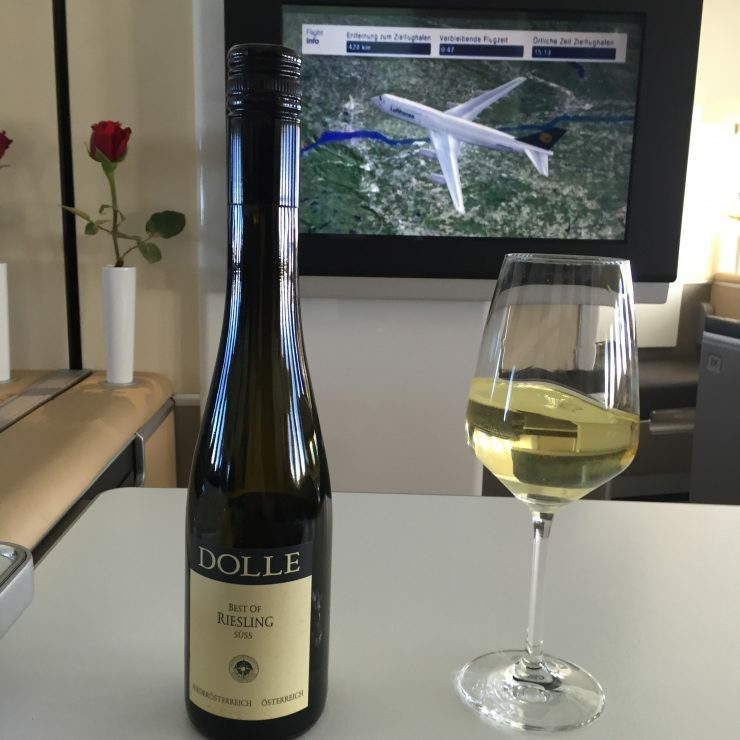 I dare say that the flight attendant’s pride, for me, meant more than the bottle she was displaying. The pre-arrival meal was uninspiring. An omelet with accompanying fruit, that unfortunately, didn’t even inspire me to take a photo of it. 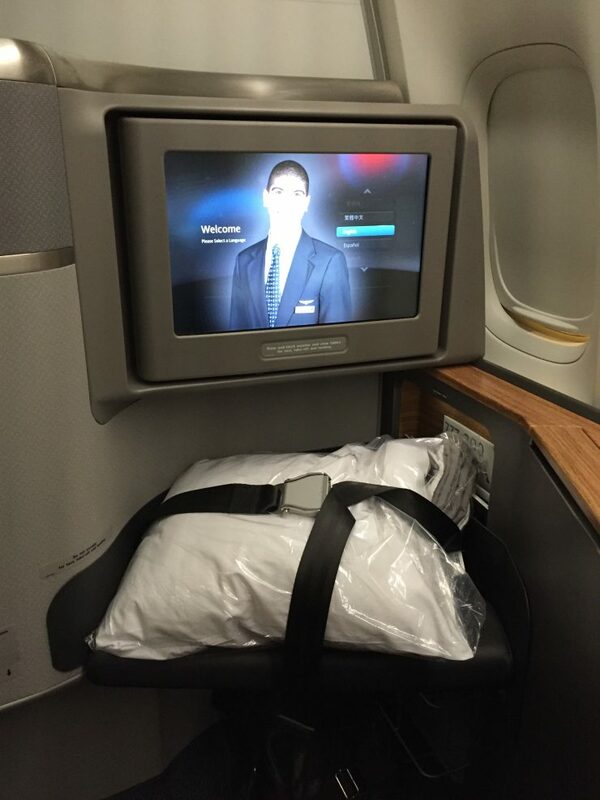 The 2nd First Class experience was Dallas-Fort Worth to Frankfurt. 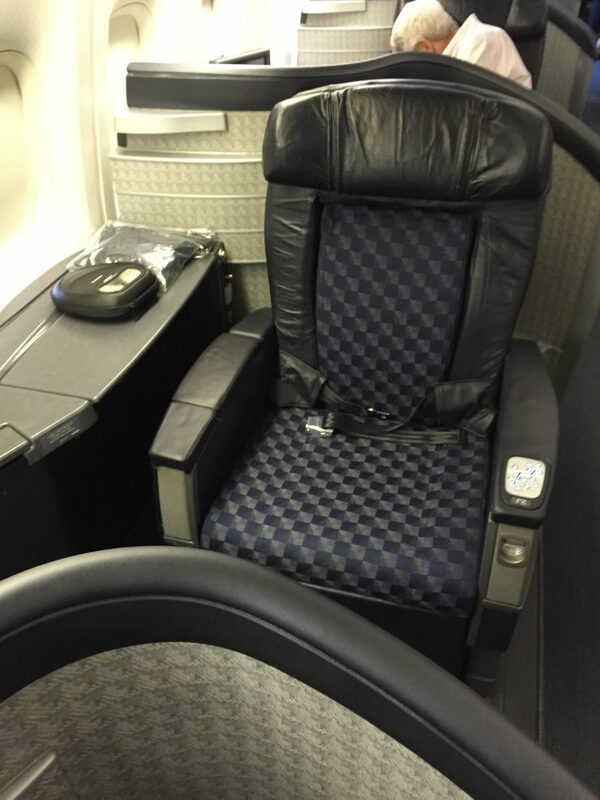 It was also on American, but this time on a 777-200, non-refitted aircraft. The seats clearly showed their age, the small monitor, no power (unless you had a special adapter), just generally tired from a hard product standpoint. My 3rd First Class experience was, shall we say, the peace de resistance. Lufthansa First Class, from Frankfurt to Washington-Dulles on the 747-8i (Lufthansa calls this the 74H). To say that this flight was wonderful is probably the undersell it. 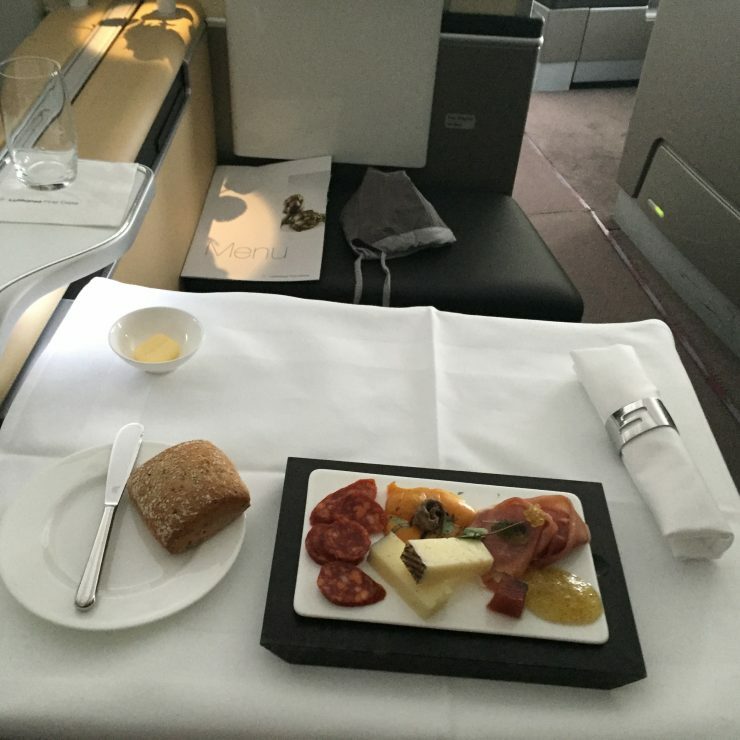 I know, I know, I love my Lufthansa First Class. But there were some special aspects of this flight. 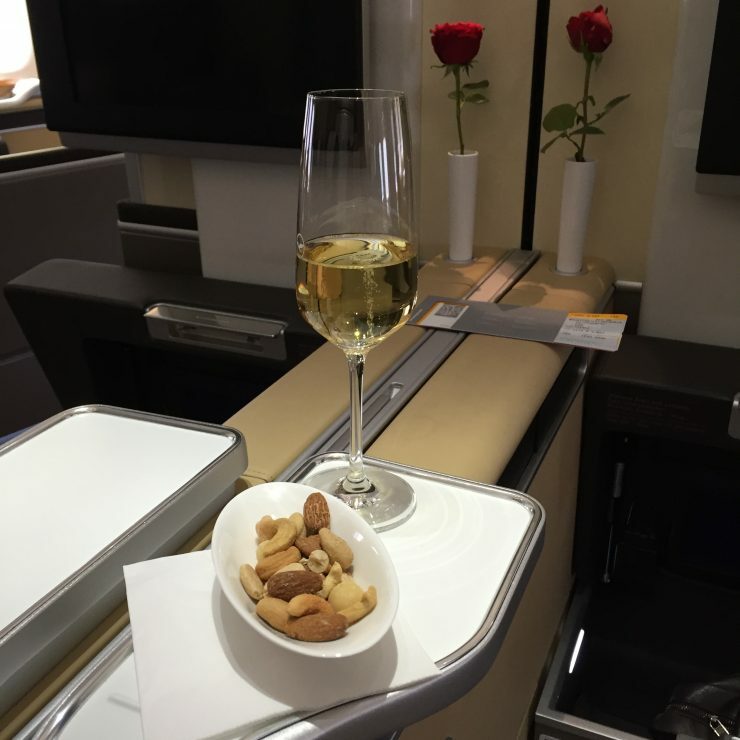 To start, and I’m sure I traded in a piece of my good husband card, as my wife flew business class. There was a logic to this. If one of us flew first class, then we would both get access to the Lufthansa First Class Terminal, Also, because of a wonderful benefit that Lufthansa offers to First Class passengers in Dulles, the one that flew in First would have to get the car. 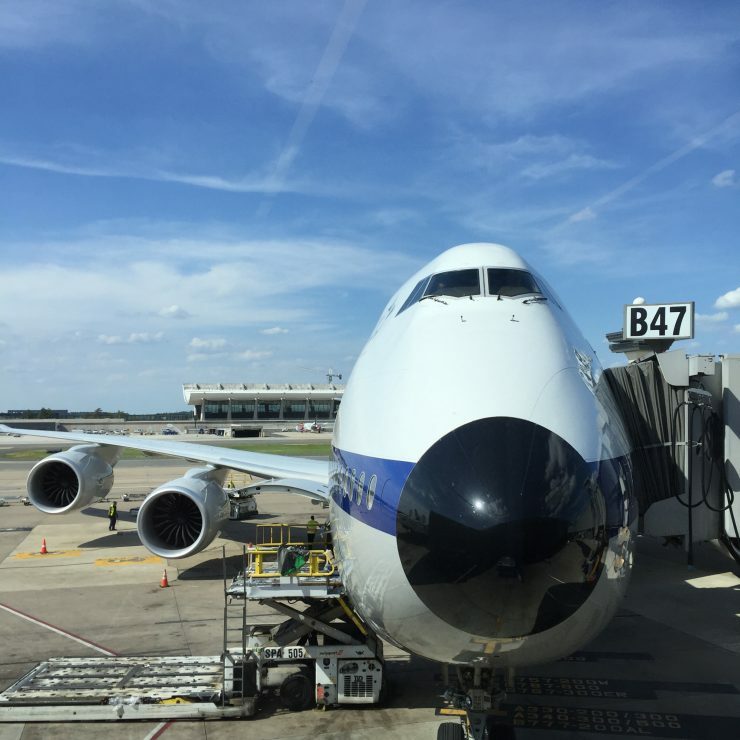 It turned out, that the crew was able to work it out that my wife was also able to enjoy the minibus transfer to the Customs hall, as well. 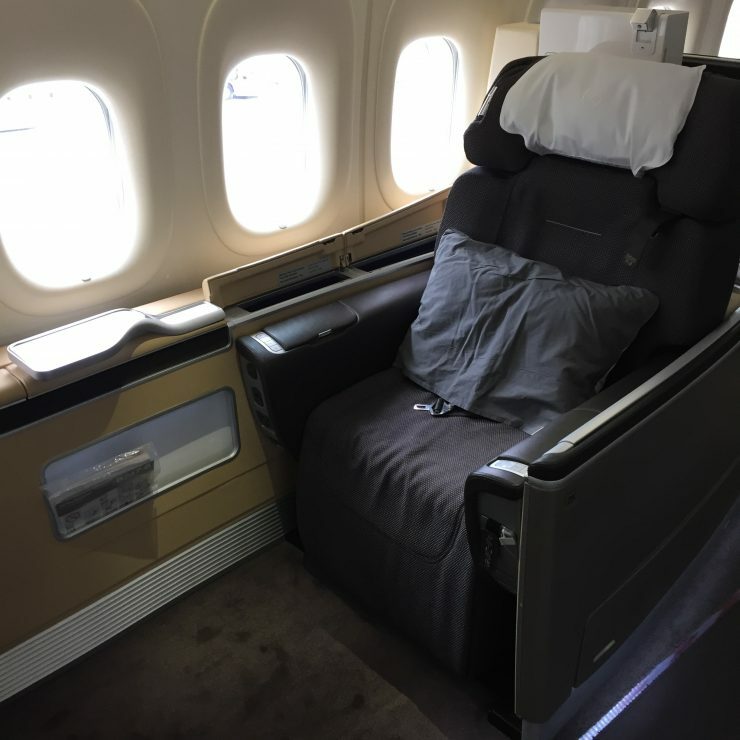 The First Class Cabin is wonderful on Lufthansa. The seat is very comfortable as well. I call it the Captain’s Chair of the Enterprise, because of the way you can control so much of the experience, right from the armchairs of the seat. Pre-departure beverages included macadamia nuts. Who could ask for more? I normally am not a huge fan of caviar. In fact, even this time, I wasn’t a huge fan. But I felt like I had to at least give it another try, so I did. It was good, but I felt bad, being unable to Finnish the rather generous helping they had given me. The sorbet, or pallet cleanser was rather interestingly provided. It was enjoyable, although I am certain I enjoyed more the whimsicalness more than the flavor. The entree, I think I made a but of a faux pas on. 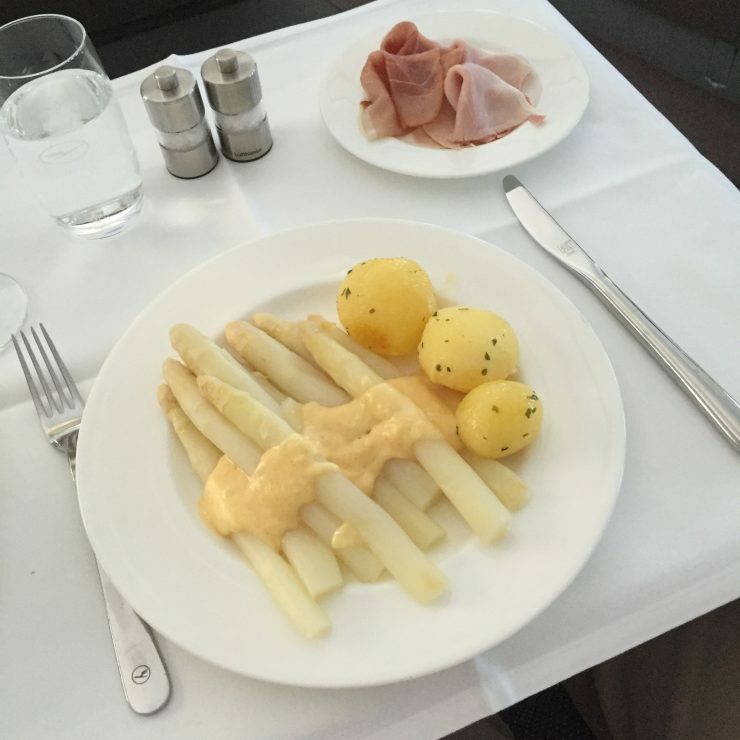 I must have been distracted from the schnitzel from the lounge, but I decided to have white asparagus with some black forest ham. It was tasty, but not nearly as filling as I was thinking it would be. After a wonderful–though not the most filling–meal, I opted for rest. 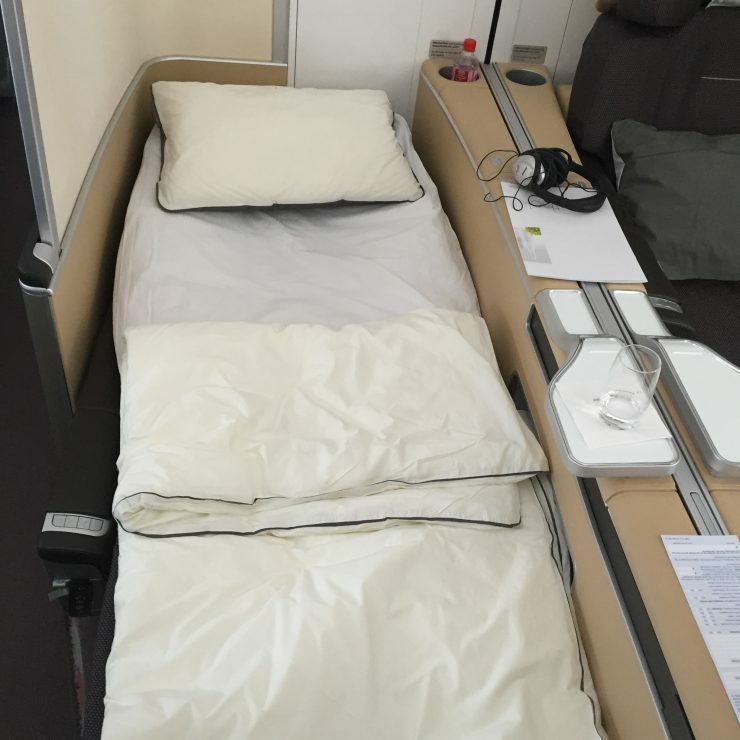 Lufthansa’s First Class bed is, in my opinion, in the top three. 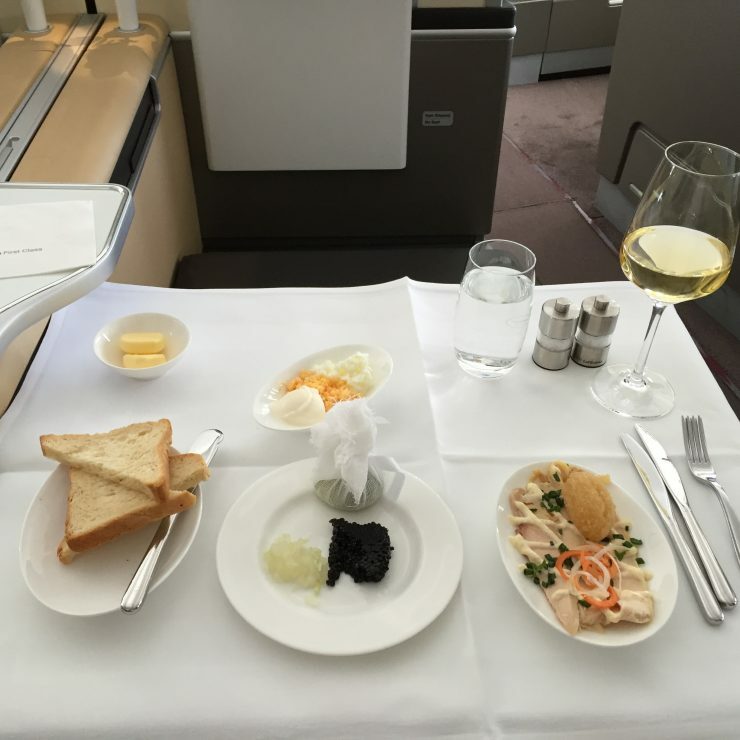 Qantas’ First Class on the A380 is perhaps the industry leader. Emirates and Lufthansa are tied for second. The difference with Lufthansa though, is that my experience is, even if they don’t make up the bed, the crew takes good care of you. In this case, I did ask the crew to make up my bed, which was quite comfortable. The pre-arrival meal, was wonderful. They offered a number of options as an appetizer, in addition to an entree. As we were close in, I had enjoyed a reasonable amount of dessert wine. It’s my sweet tooth. I enjoy the dessert win, quite a bit. 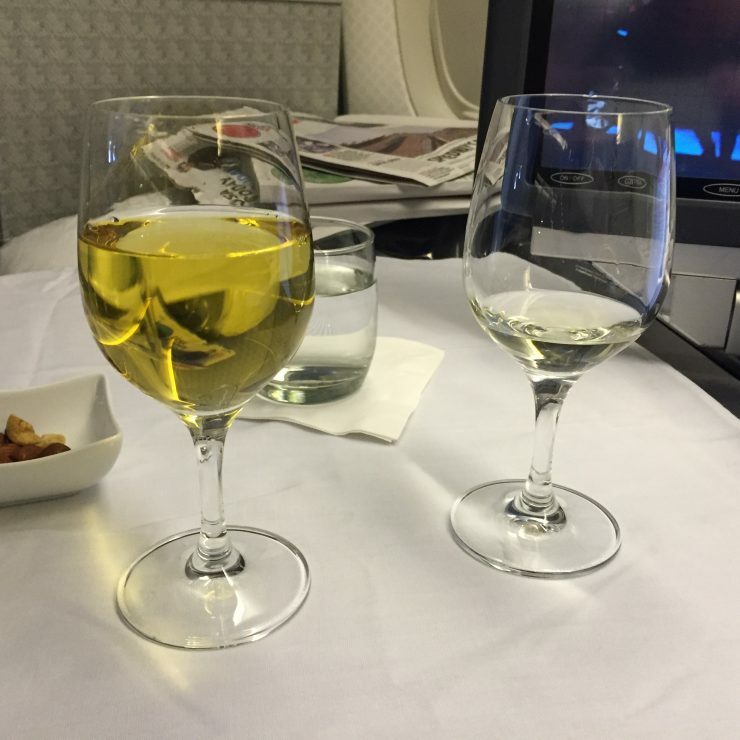 I ended up finishing the provisioned dessert wine for First Class, as we flew over New York, I think. 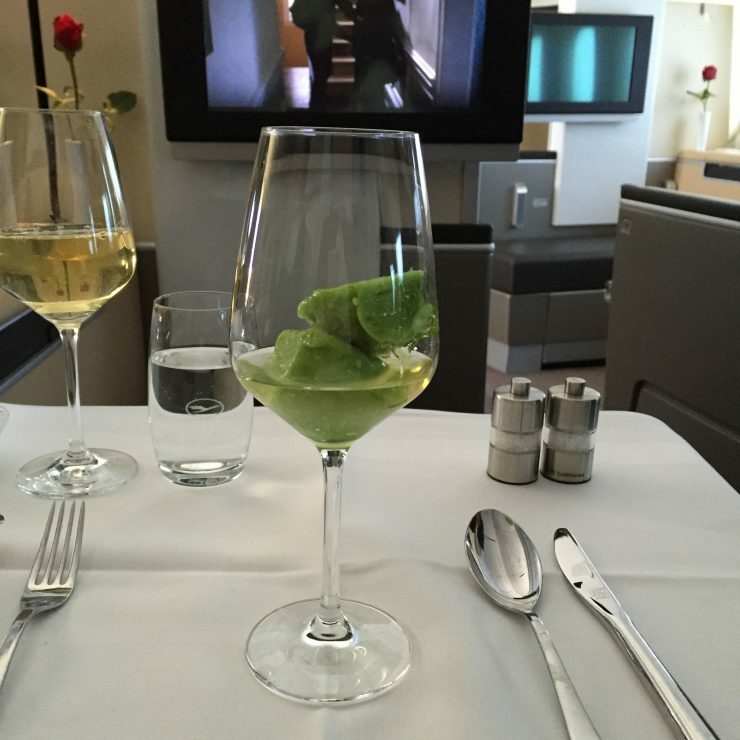 Overall, Lufthansa First Class is leaps and bounds above what a US Flagged Carrier can offer. That said, I feel strongly that American Airlines’ 777-300ER product is competitive. 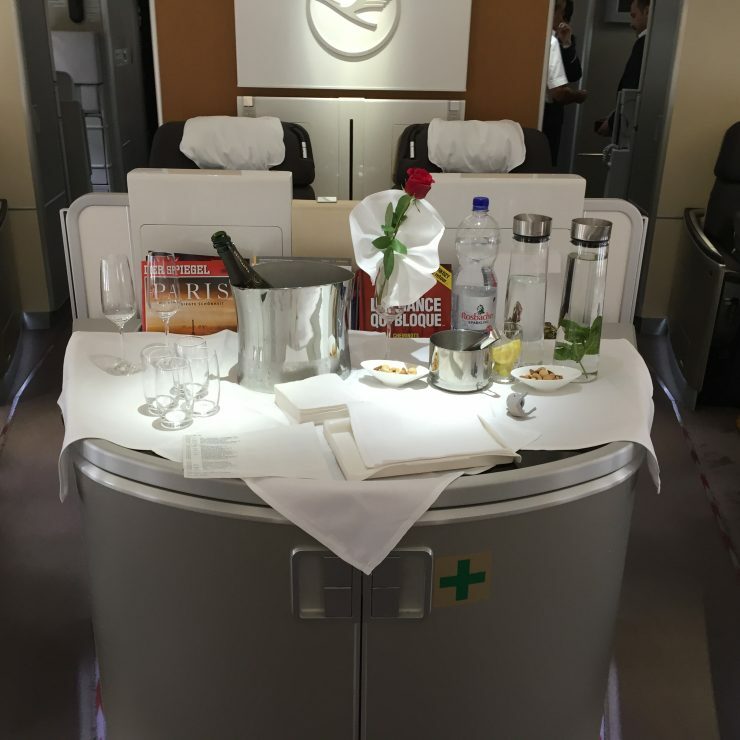 The pride that the American Airlines flight attendant exhibited with the Laurent-Perrier Grand Siecle, was paralleled, and I’ve flown on a ton of premier airlines. 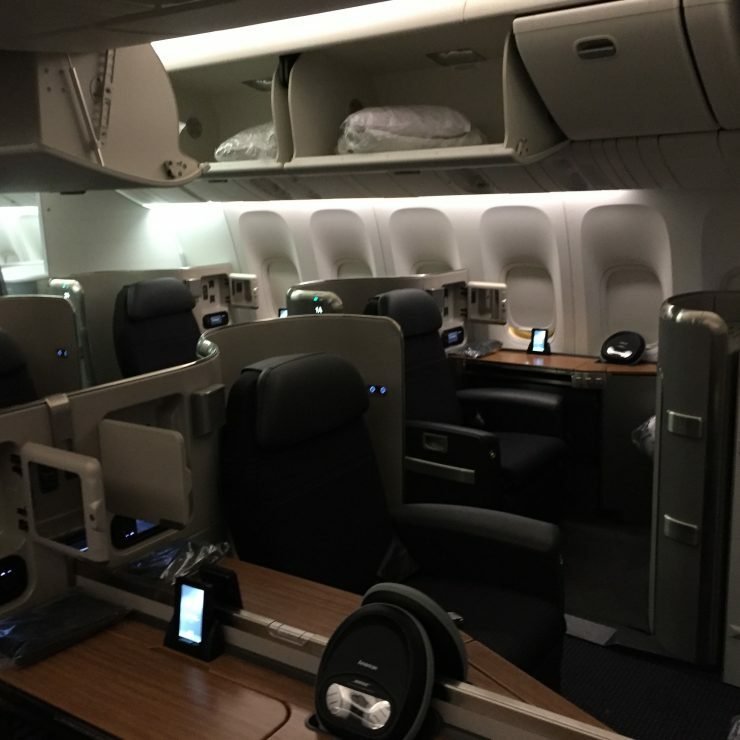 I truly believe, that with flight attendants, and products like I experienced on the 777-300ER from Brazil to the US, American Airlines can compete. That said, on this trip, Lufthansa wins the medal–to channel the Olympics, which, by now are long over. All said, it was interesting to experience three first class products, essentially back to back.